BREAKING NEWS!!!!!!! The Mi-Ki has now been accepted by the UKC! Where did the Mi-KI Originate? This is a made in the USA pure breed! I have included some links below, hope it helps, if not, please don’t hesitate to contact me, I will gladly answer all of your questions!!! http://www.animalplanet.com/tv-shows/dogs-101/videos/mi-ki/ Check this one out, click on it, then once there go down the breeds, click on the MI-KI and enjoy. http://www.cdhpr.com/CDHPRWeb.nsf/WebPages/Enrolled. Then there is APRI, ACA, NCA, North American Kennel Club,MCOA, IABCA, UCI in Germany. 6th Edition, by Dominique De Vito, released May 2009, Pages 580, 581, 930, and 934. Also it is said that Maureen made up the fact that the Mi-Ki began with two dogs brought back from China who’s breed was Won Chu Kow to make the breed more exotic and harder to duplicate. has earned a specific pure breed status. The very 1st club was built by Maureen in 1991, as The Greater Toy Mi-Ki club. 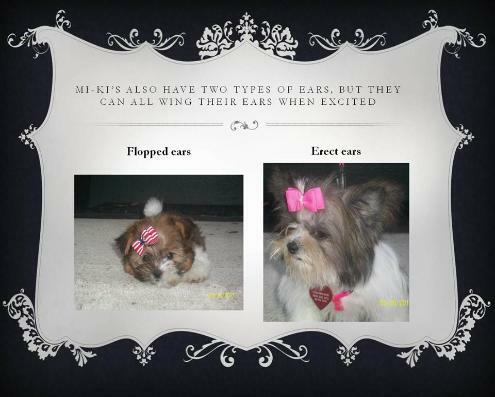 Mi-Kis were recognized by the States Kennel Club in 1995. On January of 1996, 8 members from the Greater Toy Mi-Ki club founded the Mi-Ki Club of America (MCOA). Donna Hall, that bred under the name of “Flyers” was president and bought all the dogs from Maureen. (note some dispute this, but none have proven otherwise).From there, other clubs emerged. intelligent and extremely loving to people as well as other animals. They make great pets for apartment living, need very little exercise and they bark very little, and not overly energetic which makes them great for the elderly, but playful enough for the entire family. Note: as with any breed, every dog varies and once in a while, there will be dogs that might get excited and bark, we recommend that you continue the good manners education that we implement on your puppies from the beginning, in other words, obedience classes. The Mi-Ki range in size from 3 to 8 lbs, but the standard is 3-10 lbs (ours range from 3-8). They adapt to any lifestyle. Another outstanding feature is their long beautiful coats of hair, not fur. A metal comb is all you need once a week to keep them in condition, a bath once a month, so if you like the long coat no groomer needed for this breed. (unless you want to).